The players are in Paris, the men's and women's draws have come out, and tennis' long time foe - the weather - is already wreaking havoc during the qualifying matches and players' practices. Yes, the French Open is upon us at last! For fans, every Grand Slam invokes a certain routine. At first, it's the draw ceremony. You spend days counting the minutes, you moan about the coverage of the draw being absolutely useless, and then you spend hours lamenting your favourites' difficult paths to the elusive titles. At this point (this is now, in case you're wondering), you realize that the tournament is going to start before the weekend's even over, and you must stock up on all the necessary equipment - food (you won't have time to leave the house for two weeks now), tissues (for that moment when you start breaking down in the middle of a sleepless night), and a fair amount of alcohol. While urging everyone to vamos (or ajde or allez or davai, or all of them if you're a Putintseva fan) responsibly, here's a drinking game to pass you through the two weeks of the 2013 edition of the Roland Garros. 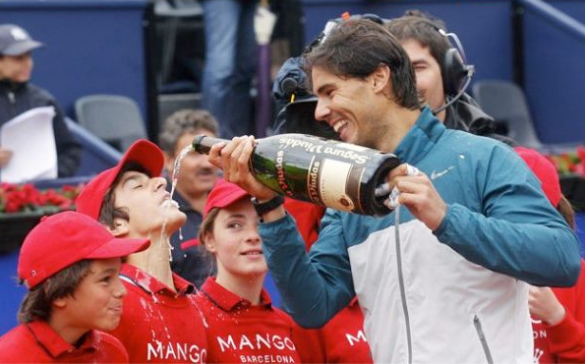 Take a swig every time a commentator proclaims Rafael Nadal or Serena Williams the heavy title favourites. Down a shot if there's a discussion of the alleged unfairness of Rafael Nadal's #4 seed or its effect on the Djokovic-Nadal predicted semifinal. Take a sip if anybody calls Maria Sharapova 'Cow on ice'. Drink if Benoit Paire, Jerzy Janowicz or Ernests Gulbis hits an unnecessarily ridiculous dropshot. Finish your drink if it wins them the point. Pour yourself another drink if they lose the point and go on a youtube-worthy meltdown. Take a shot on every single rain delay. Finish your drink when grunting comes up. Take a swig when Petra Kvitova botches an easy shot. Take two swigs when Tomas Berdych does the same. Hospitalize yourself if they're both playing at the same time. Take a shot if the scheduling for the next day makes no sense. Make that two shots if it's quarterfinals day and the matches are all at the same time. Sip every time the French crowd starts booing a player. Finish your drink when they begin whistling. Take a swig each time you have to use the Roland Garros mobile app (Android or iPhone, but you really don't want to install it). Finish your bottle if Rafa and Serena actually win both titles. Drink enough to completely pass out if you're FFT president Jean Gachassin, since a French player didn't win. Take a swig when they show clay particles flying away in slow motion from a players' shoes while he/she serves. Take a shot when a commentator mentions Rafa's top spin and the whole 4000 RPM issue. Sip every time a player loses his/hers footing and crashes down into the dirt. Drink whenever a commentator mentions that Federers' only win here was when Rafa was ousted by Soderling.